The Steinel 34103 SV 803 heat gun emits airstreams at temperatures ranging from 140 to 1,050 degrees F. The gun’s temperature setting can be varied continuously at the low and high airflow stages, and is fixed at 140 degrees F at the cool air stage. Similar in shape to a hair dryer, the gun is lightweight and balanced to reduce fatigue. The heating element is reinforced to extend coil life and has a ceramic disk to provide even heat. A thermal fuse in the heating element protects against overheating. The gun’s circuitry is encased in injection-molded plastic to prevent disconnection, and the fully enclosed slide switch and secured power cord help ensure reliability. This heat gun is suitable for many applications from shaping and welding plastics to working adhesives and touching up shrink wrap. Dimensions 9.75 x 11.0 x 3.5 inches (H x W x D). Power Cord Double insulated, industrial grade rubber, length: 6.5 ft.
Heat guns are hand tools that emit a stream of heated air at variable temperatures up to 1,300 degrees F (700 C). Most guns have an electrical heating element to control output temperatures and adjustable fan motors to regulate and focus airflow. 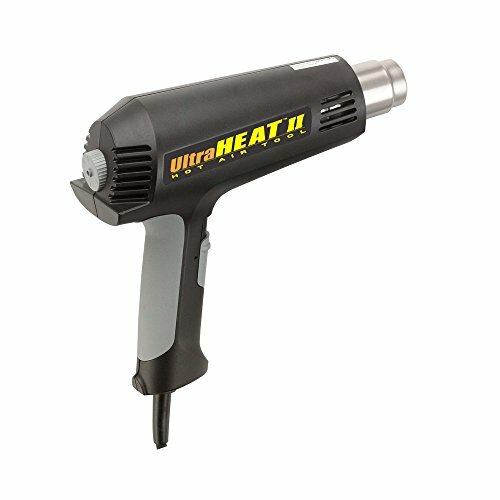 Heat guns with high airflow output (greater than approximately 20 cubic feet per minute) are sometimes called heat blowers. Heat guns can be used for a variety of applications ranging from copper and plastic welding to touching up shrink wrap. Accessory nozzles (sold separately) are used to shape the air stream over a wider area, or direct it around pipes and tubing for even heating which prevents adjoining surfaces (such as panes of glass) from overheating, and some heat gun models incorporate workbench stands to allow hands-free operation. Steinel manufactures heat guns, glue guns, gas torches, and sensors. The company, founded in Germany in 1959, meets International Organization for Standardization (ISO) 9001:2008 standards and is Restriction of Hazardous Substances (RoHS) compliant. If you have any questions about this product by Steinel, contact us by completing and submitting the form below. If you are looking for a specif part number, please include it with your message.